Continuation from last week’s blog. Retro Diary #67 – Xbox (and Classic PC) week! After my brothers were done with the PS2, they looked up the attic for more console Tony Hawk games, and found Underground 2 on the Original Xbox, so I set up that console for them in the sitting room. My brother has been playing Underground 2 for about a week now, completing the story mode several times now and now going through classic mode to get the rest of levels or whatever else needs to be unlocked. My other brother had some games of Tony Hawks Underground 2 as well. The brother that wanted to play THUG2, has 100%’d it, too. Meanwhile, I installed Tony Hawk’s Pro Skater 2-4 and Underground 2 on my PC, I played through Underground 2, and now I’m playing Pro Skater 3 and 4. I’m still tryting to get 2 working properly. I’ve beaten THPS3’s career mode twice so far, once with my own skater, the second time with Doom Guy! My brother has almost 100%ed THUG2, he trying to get all of the gaps now. He has taken interest in real skateboards, and has shown me some he is interested in. Meanwhile, I myself am playing through Tony Hawk’s Pro Skater 3 on PC, I’ve played through the career with my custom skater, Doom Guy, Wolverine, Darth Maul and Doom, Guy! My brother has given up on getting all gaps in THUG2, and is instead making his own custom story for the game using the creeate-a-goal feature, and he wants me to check it out when he’s done… I can’t wait to try it! I have played through THPS3 with Private Camerera and Steve Calberello. I’m aiming to, m,inus all gaps, totally 100% the game with all characters! That’s it for this weeks retro diary, see you all next week, I guess. A fund this auld thing, an realised that it can record CDs tracks tae cassette, an bein inspired by Cassette Culture, (that an ma iPod classioc is broken) A decided tae git some o ma favourite song thegither, burn thaim on a CD, an record thaim tae cassette! A gied whit A’v duin sae faur on a walkman… thay soond kind o awful, but that coud be acause the tapes hjeids are dirty, an A didna knaw that the white bit at the stairt were cleaners meant tae clean the heids afore recordin an playin, sae A uised a pencil tae mak it stairt at the recordin/playin bit… oops… lesson learnt, sae A’m daein it again. 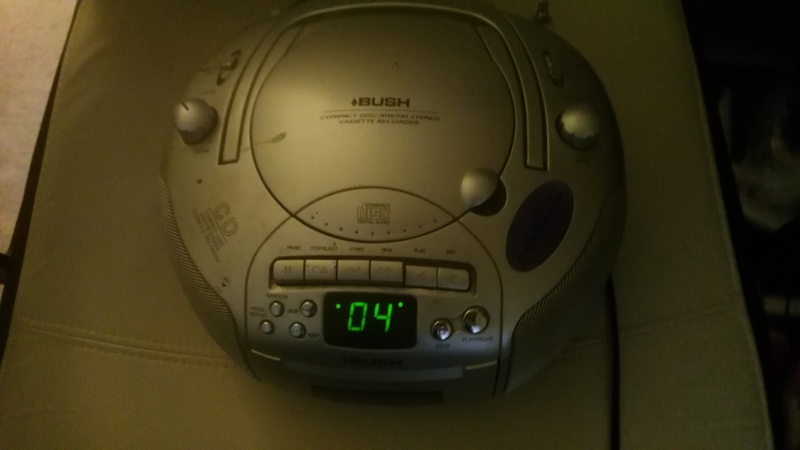 E’en gin it still soonds bad efter, A’v got tae bite the bullet, ma iPod needs repairin, an A’m skint, an A’v ainly got a portable CD player an a walkman… an portableCD players are awkward tae uise…. Rocco and I decided to play a Tony Hawks Underground again, but this time, I played through the story, and I did it so that I can demonstrate the alternate ending, which you can get by playing through the game twice, I believe one of the playthroughs has to be on sick mode. Spoiler Alert: The alternate ending is the 2nd last cutscene, where Eric Sparrow declares a race with the player skater, but instead of doing the race, the player skater just snatches the tape from Sparrow, knocking him out cold… serves him right, I think! We then played some multiplayer games of THUG, one was a horse game, which I somehow lost… grr! We then played a load of other games, such as Tony Hawk’s Downhill Jam, SmackDown vs. Raw 2006, Smackdown vs Raw 2011, Wipeout Fusion and others. It was a nice day, and while all of this was happening, the sun was shining, it was nice and warm outside, and we had a barbecue! I’ll not forget this day any time soon! Retro Diary – PS2 day! I’v decided to do this quick retro diary, because today was a fairly interesting day. My brother asked me if I can set a console up so he can play a Tony Hawk game, he was specifically wanting to play the Underground games, which I only had on PC in my room, so I looked up in the attic to see if I had the games on anything else, and as it turns out, I still have a copy of the game on PS2, so we decided to set the PS2 up in the sitting room, got the controllers and memory cards, and we were off! Still, it matters not how it looks, but how it plays, and the game is just as fun now as it was back then! My sister came in at some point and went on our laptop, never touched her smartphone, so it was almost like a mini-2000s-throwback party…ish! Me and my brother has a fairly interesting conversation of what defined the 2000s, because from my point of view, it was half the 90s, the other half what became the 2010s. It’s kind of depressing how pretty much the span of time where so much happened in the consumer front has ended, the decade from the 1940s to the early 2000s were so prolific and so much happened, that it seemed like an eternity from one end to the other. Of course, every decade was very important, but it’s like now, it’s all slowed down, and time goes faster for us because not as much happens, like as things were before. It’s kind of sad, really. My brother played through the game all the way to Moscow, and halfway through it all, he asked if I wanted to get another controller and play a 2-player game, so we decided on Smackdown vs. Raw 2011. The game didn’t look as bad on the TV, and I still to this day think it looks really impressive for a PS2 game! We played 2 matches, both of which he won… grr! Anyway, that’s it. I thought that was worth mentioning here.